The later Porsche 911 which uses variants of the 996/997 water cooled boxer engine incorporates “cast in” aluminium cylinder liners manufactured from a specially impregnated within the engine block. The same configuration is also found in Boxster 986/987 and Cayman engines of all capacities and all are prone to cylinder liner failures. When damage occurs, H T Howard can machine out the damaged cylinders and fit replacement cast iron liners for a cost effective yet reliable repair. 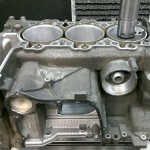 Most frequently, damage occurs in the second cylinder bank housing pistons #4,#5 and#6. 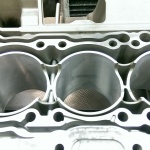 The failure usually results in scoring on the cylinder wall and accompanying piston and is often identifiable in service from signs of increased oil consumption, smoking or a slight ticking noise from the engine. H T Howard can repair anything from a single damaged bore for the most cost effective repair through to the replacement of all six liners in both cylinder banks. 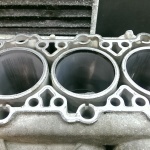 As the problems often only affect one half of the engine cases we are also happy to offer repairs to the three cylinders on this single side. Machining operations are carried out using our BERCO AC650M boring machine and are more fully covered on our cylinder liners page. The damaged engine casing is mounted on the machine bed and clamped in position. The first cylinder is centred using the special stylus connected to a dial gauge within the boring column. Once set, the machine bed is locked in position and the stylus removed. A tip suitable for machining aluminium is fitted in the tool holder and set to the correct size using a dedicated micrometer. Next, the boring tool is transferred to the machine column and the boring process can begin. The existing cylinder liner is removed in a series of cuts to minimise distortion and heat build-up during the machining process. 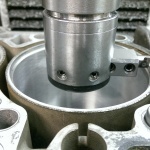 Once the original liner is removed, the block can then be machined to accept the replacement liner. Liners used for this application are of the flanged type meaning that at the top they have a larger diameter compared to the main body of the liner. To determine the exact size required, the new liner is measured and a small allowance subtracted to give the correct interference which ensures the new liner remains tightly fitted to the block when in service. Once the diameter for the main body of the liner is machined, the upper flange diameter is cut using a tip with a flat profile which is measured and set in the same way as the cutting tip. Following the boring operations, the cylinders are honed to give the exact size required to accept the new liners and also to create the optimum surface finish to ensure full contact between the parent bore and new liner which in turn promotes good heat transfer between the two. After washing, the block is transferred to our oven and heated to expand the block which allows for the new liners to be dropped into place. 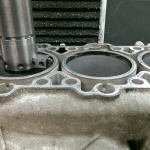 Special attention is paid to the alignment of the cut away parts at the bottom of the liner. The block is returned to the oven and allowed to cool over a long period to reduce stesses and eliminate any possible distortion. Once fully cooled, the liners need to have pressure applied to ensure that they are fully seated. Any additional work needed to match the cut away parts of the liners to the crankcase is carried out before the blocks are ready for the final boring, honing and re-facing operations which are required to complete the job. All these subsequent operations are similar to those performed when working with more conventional engines and are covered in detail on the relevant pages. 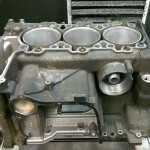 Cut away crankcase portions which replacement liners will need to be aligned to.